The author is a sociologist who has written extensively on human rights and recently on climate change. In her new book she develops the idea that protecting everyone’s human rights and slowing planetary warming are the same goals. It is now clear that the leader of the richest, most powerful country in the world – United States President Donald J. Trump - has set the trigger of destruction by exempting the United States from the international treaty that aims to give the entire planet some reprieve from warming. That is, all countries of the world have entered into an agreement to end reliance on fossil fuels, except the United States, which withdrew at the outset of the Trump Administration. Regardless of the US position in the future, the country’s emissions are so very extremely high they will continue to wreck havoc on the entire world. 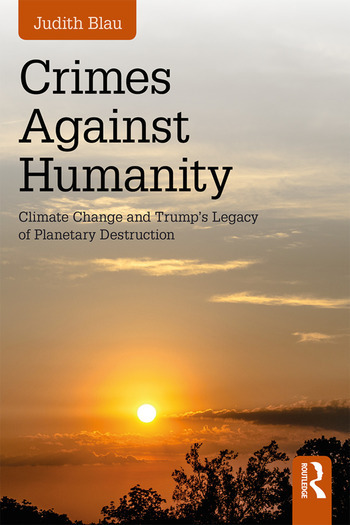 While Blau maintains that President Trump has committed a crime against Humanity, even beyond his tenure the book sets the stage for a human rights approach to climate change for the future. Food a Human Right? – Or Commercial Product? Judith Blau is Professor Emerita in the sociology department at the University of North Carolina – Chapel Hill, and was director of the Chapel Hill-Carrboro Human Rights Center, which provided programs and services for refugees and immigrants. She served on the board of the North Carolina American Civil Liberties and was president of Sociologists without Borders, an international nongovernment organization, and the Southern Sociological Society. She formerly edited Social Forces, and several of her past publications are about human rights, with others focusing on climate change, architecture, and race.